Engaged communities improve care quality and deliver benefits to families, those receiving and proving care. And whilst this sounds obvious, councils, care agencies and care homes, find it really challenging to define and implement strategies to encourage such engagement. The ever present fear of change combined with ill-perceptions on data security and data management, prevent a shift towards new paradigms of communication, community engagement and care delivery. But there is serious drive, both from forward looking commissioners, and the Care Quality Commissioning (Andrea Sutcliffe‘s proposed guidelines for inspection explicitly mention the need for care homes to get more involved in their communities). This blog post, and a series of posts to follow, will give our own views on how to implement communication strategies, activities, as well as tools to encourage community engagement, harness community resources, such as volunteering organisations and customer facing local businesses, as well as family and friends of people receiving care. By increasing collective awareness of the services received by, and the needs, of an older population, communities tend to become active participants in the bigger picture of care provision. This approach has been much publicised of late, perhaps not always as effectively as most in the care sector wished, by the latest news coming out of G8 on dementia. Involving retail businesses, bus companies and banks on creating a degree of community alertness on dementia seems to be widely accepted as a good idea. But for this to happen, these businesses need to be somehow connected to care providers. Who should I, as a care provider, be connecting with then? Well, there are several levels, let’s start by understanding who you already communicate with, and how the wider community fits in the picture. Institutional: connecting with commissioners other organisations involved in providing care to your service users will improve everyone’s experience. Engaging in this day and age is easier than ever. Brands and businesses are using social media in full swing, creating groups of followers and engaging actively with those communities, businesses have now realised they can improve their services, customer support and increase sales. By building community links using social media, care providers can engage with neighbourhoods, harnessing goodwill and the collaboration of not just volunteers but all those around them, be it neighbours, neighbourhood watch groups or businesses with an element of customer interaction. Much of this can be achieved with social media, preferably combined with social engagement initiatives, such as open day events, tea parties, arts and crafts or open workshops focused on specific skills or interests, preferably in collaboration with groups of volunteers or local businesses. Nourish Care designs and implements communication strategies using Facebook, Twitter and a handful of carefully selected apps to enable care providers to create and engage with followers. 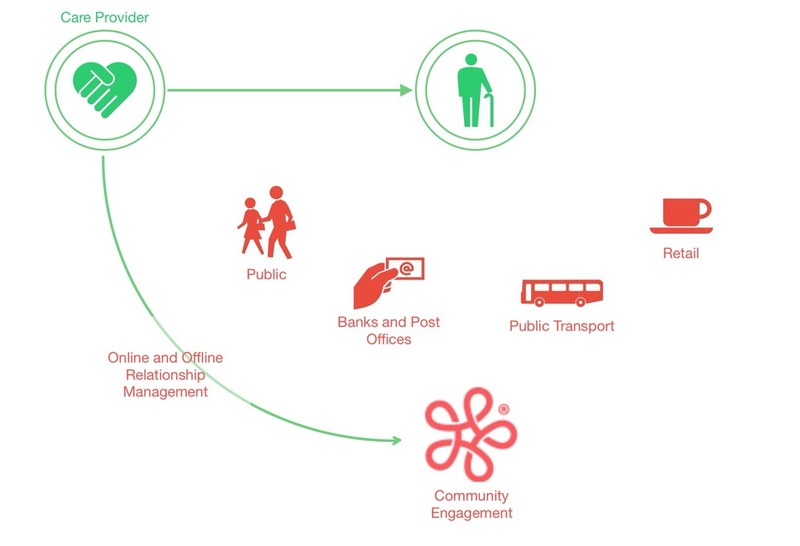 These platforms empower both care providers in opening up to their communities, explaining what they do, how they deliver their services, how people in the community can help, and publicise any community engagement activities. This can generate significant followership, but most importantly, this will enable anyone within the community to get in touch, either to offer help, or to report occurrences involving people under care. Segmented communications, however, such as keeping in touch with family and informal carers, requires better, more focused approaches. This is where Nourish Care’s own care solution can give access, on a need to know basis, of services being provided, telecare and careline alarm notes, status of the wellbeing of their loved ones under care, as well as case notes. This will empower informal carers to get more involved, and to play a more confident role in the context of providing care to a friend or relative (ask us to know more about our family portal). Nourish Care also enables you to manage your resources, your services (including chronic disease management), rosters, electronic tracking and automated reporting, as well as providing a direct interface with care commissioning. Care commissioners can manage outcomes based plans, monitor service delivered, its outcomes, and cases. And integrated health and social care teams can get access to combined information, again, on a need to know basis. This enables hospital teams to get access to a patient’s network of carers, medically relevant case notes, medication, chronic disease management. Finally, discharge notes can be added, enabling a seamless pathway after acute admission. We provide advice to care providers on how to design, roll-out and manage initiatives for engagement with the community, health care providers, commissioners and informal carers. Initial assessment is absolutely free, no strings attached. Let’s have a cup of tea?